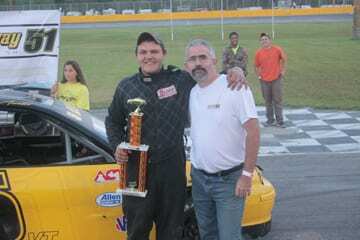 Tyler Austin (5) celebrates his Bond Auto Street Stock win at Speedway 51. Jeff Marshall (32) continued his fantastic 2015 with his fourth win of the year in a caution free North Country Ford Late Model 51 lap main event. The first 13 laps showed a battle between Colbrook’s Brandon Lambert (77) and Littleton’s Russell Clark (02). Lambert finally cleared the 02 car but had no time to enjoy the fruits of his labor. Marshall was able to pull to the outside of Lambert a few laps later and the drivers would spend the next handful of laps exchanging the lead before Marshall cleared Lambert for the lead. The Lunenburg, VT native wouldn’t really be tested the rest of the way en route to his second straight Speedway 51 victory. Graniteville VT’s Chip Grenier (9) raced from the middle of the pack to finish second in his first race at Speedway 51 since the opening weekend. Lambert held on for a third-place finish. For the third time this season, the father son duo of Craftsbury Common, VT’s Mike and Stephen Martin drove to victories on the same night in their respective divisions. Mike (01) got around the 4 car of Milton, VT’s Derrick Calkins and held of the late charge of last week’s winner Graniteville, VT’s Stephen Donahue (26) to take the 35 laps Sign Depot Tiger Sportsman feature. Donahue had to settle for second and opening weekend winner Christopher Pelkey (64) from Barre, VT completed the podium. For Stephen (01) he did his part earlier in the night winning the A.B. Excavating Dare Devil feature. After it looked like he was going to cruise to his third victory of the season, Whitefield NH’s Christian Laflamme (10) was able to catch Martin. The two drivers went 3-wide around a lap car with 2 laps to go before Laflamme crushed the front straightaway wall passenger side first to bring an abrupt end to the youngsters day. Martin would take home the checkered flag while Waterbury’s Kelsea Woodard (68) and Duxbury, VT’s Peyton Lanphear (22) would complete the top three. Calais, VT’s Tyler Austin (5) drove to his first Bond Auto Street Stock feature win and it was never in question. After starting up front the 18 year old led from start to finish and was never really tested. Aaron Poulin (11) of Berlin, NH fought his way to a second place finish but failed post race inspection giving the position to the man they call “Lt. Lightning” Gorham NH’s Jean Leblanc. Duxbury, VT’s Reilly Lanphear finishes third. Point-leader Jared Plumley had mechanical problems as he saw his four-race winning streak come to an end as he failed to finish for the first time in 2015. Jenna Randall (122) of Stark, NH received her first win in the Shweppes Pure Stock division leading flag to flag. Kevin Keene (07) of East Hardwick, VT finished second and last week’s winner Alan Derrington (75) goes back to Bethlehem, NH with a third-place finish. Join us this week as all five divisions will be in action plus we’ll have a main event featuring the North East Street Stock tour.